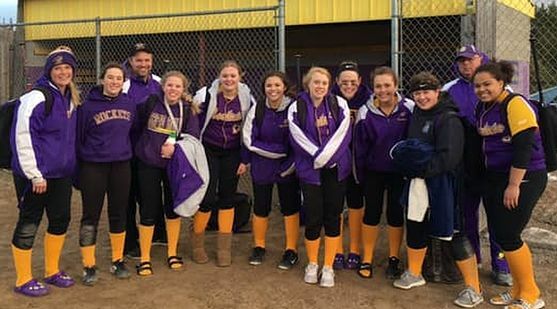 RAPID RIVER---The Rapid River High School girls softball team opened the season Tuesday with two wins over Superior Central, 14-7 and 14-4, in Rapid River. The doubleheader was supposed to be played Thursday, but with a winter storm bearing down on the U.P., the decision was made to play the games a day early. Natalie Belanger got the win in the circle during both games. In the opener, Belanger allowed two hits and struck out 12 batters. She also had two hits at the plate and scored three times. In the second game. In the second game, Belanger allowed four hits and struck out six more batters. Cecelia Pilon had a hit, walked three times, and scored four runs, in the first game. The Goodacre sisters, Kirsten and Emily, both had two hits and scored two runs apiece in the second game. McKenzie Schram had two doubles, the second of which came in the fifth inning to push across the final runs to put the mercy rule in effect. Rapid River opened the season as an honorable mention in the state Division Four pre-season coaches poll. The Rockets face Stephenson next Monday afternoon.